The council is planning a weekend-long event, “Armistice@100,” on Saturday, Nov. 10 and Sunday, Nov. 11. According to the New Britain Veterans Council, approximately 3,500 New Britain residents fought in “The Great War”, World War I. 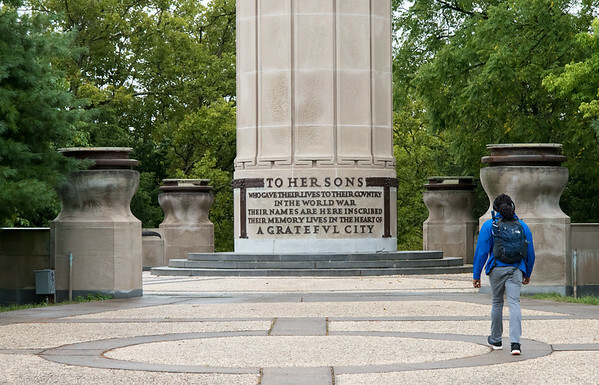 123 of those men did not return, but they are memorialized in the city’s World War I monument at Walnut Hill Park. “There’s a tremendous amount of heritage and connection to World War I in New Britain,” said Tom Higgins, council president and co-chair of the event. The weekend will kick off with a military-style dress ball at 5:30 p.m. on Saturday, Nov. 10 at VFW Post 511 featuring a period music orchestra. Lt. Col. Frederick A. Peterson III, JD, a retired member of the United States Marine Corps, will deliver the event’s keynote address. Peterson, a Kensington resident and a St. Thomas Aquinas High School graduate, is a decorated combat veteran. The event will also include the New Britain Marine Corps League performing a ceremonial saber carving of birthday cakes marking the 243nd birthday of the Marine Corps. At 11 a.m. on Sunday, Nov. 11 at the World War I Memorial at Walnut Hill Park, the council will recognize those from New Britain who fought and died in the war. Recognition of each veteran listed on the monument will be made by member units of the Council: General Haller Post, VFW, DAV, Marine Corps League, Franco-American Veterans, TGM Northwestern Veterans and the American Legion. This will be followed by “Taps,” a rifle salute and comments from dignitaries including Burlington resident Brigadier General Ralph Hedenberg, who commands the Joint Task Force of the Connecticut Army National Guard. There will also be a special recognition for the 100th anniversary of Poland’s independence during the Nov. 11 ceremony. Higgins said the two-day celebration of Armistice Day’s 100th anniversary has multiple goals. “We really want this event to not just focus simply on the veterans, but the New Britain community as a whole,” Higgins said. Higgins also said he wants to show veterans and members of the community the importance of veterans’ organizations. Higgins emphasized that the New Britain Veterans Council wants to get younger veterans involved. “We’re trying to let people see and understand the needed vitality of veterans’ organizations,” Higgins said. According to Dennis Taricani, co-chair of the event and Judge Advocate of the council, the school district will teach students about New Britain’s involvement in World War I during lessons in September and October. A luncheon after the monument service Nov. 11 will be hosted by the New Britain Elks Lodge #957 and catered by the Culinary Club of the New Britain Boys and Girls Club. During the luncheon, the council, school district, New Britain Public Library and Elks will award six scholarships to middle school and high school students for an essay contest related to what they’ve learned about World War I. The World War I curriculum will also include lessons about the four-legged war veteran Sergeant Stubby. Sergeant Stubby, a Boston terrier mutt, was part of the 102nd Infantry from Connecticut which saw the first action in France in 1917. Stubby was adopted and taken to France by New Britain private Pat Conroy. Conroy, a third generation Irishman, was 25 years old when he found the stray dog while training in New Haven. Conroy smuggled the dog onto his ship departing for Europe, and the rest is history. Stubby eventually became one of the most decorated war dogs in the country’s history. According for Higgins, Conroy’s family was very involved in New Britain and his relatives were instrumental in creating New Britain Elks Lodge #957. In May, a life-size statue of Sergeant Stubby was completed in Veteran’s Memorial Park in Middletown. His taxidermied body can be found in the Smithsonian National Museum of American History. The Amistice@100 Remembrance Gala costs $40 per person or $75 per couple. For more information on the ball and for tickets, go to www.armistic100.org . Any organization, veteran or family of veterans who would like to be involved in the anniversary event can contact Tom Higgins at 860-614-8002. Posted in New Britain Herald, General News on Friday, 14 September 2018 18:40. Updated: Friday, 14 September 2018 18:42.